Yesterday our team volunteered at Second Chance, Inc. in Baltimore, MD. We took the morning and early afternoon to assist a great organization in their tremendous efforts to end waste in the Baltimore and greater area. We didn’t have a large group this time volunteering, but the few were mighty in their endeavors to master the great dilemma of matching cabinets. 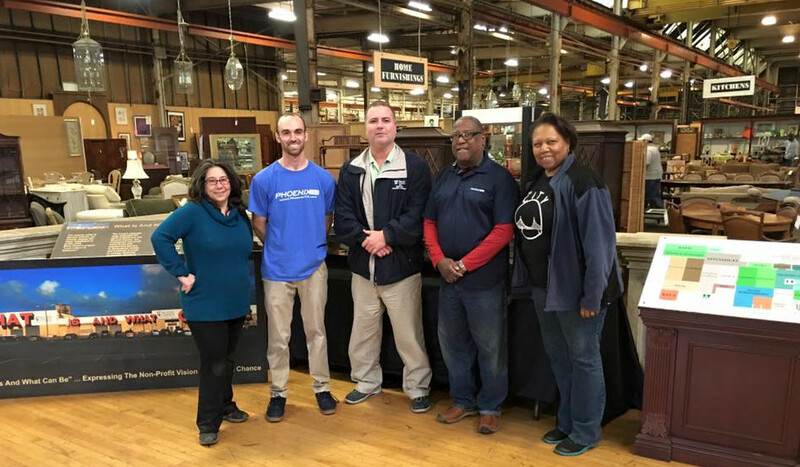 Second Chance, Inc. is a “501(c)(3) nonprofit that provides people, materials, and the environment with a second chance” through donations, their store, and workforce development program. They accept a wide variety, well literally everything, of donations to resell in their retail space in Baltimore city. They resell building materials, home fixtures, doors, furniture, pianos, records, cabinets, refrigerators, and numerous goods in their massive warehouse that’s best described as a “200,000 square feet of retail space” remnicient of a museum. With the revenue earned from the sale of donated goods, they provide job training through the workforce development program. This program employs individuals who face employment adversity and obstacles due to a variety of reasons in the greater Baltimore area. As Jem, the Second Chance Warehouse Manager explained, the job program impacts countless individuals who come to Second Chance where they earn a decent pay and within three to six months land better paying jobs and opportunities. They help people earn a second chance. As you might imagine, there are various jobs available when volunteering there. Jem tasked us with matching cabinets and shelving units together. This was no simple task and luckily we had the assistance of Marcellus, an employee in their workforce development program. The cabinets and furniture was reclaimed and donated from a mansion in Connecticut. Not all of the matching materials arrived yet since they continued to come in by the truckload every day. This experience opened our eyes to a unique business that thrives on giving back and ending waste in every way possible. When you travel throughout the warehouse and read the product descriptions you begin to surmise how this organization makes a difference on such a large scale. All the goods have a history and story. Check out the pictures from our time there. Hopefully you will take the time to at least tour the store the next time you visit Baltimore. What Does it Take to Become a Network Administrator?